Are you a Flete Baby? Last week I heard in a conversation at Mothecombe Teahouse that one of our guests staying at Nepeans cottage was a Flete baby, returning to the Flete Estate to celebrate her 70th birthday. What is a Flete baby? 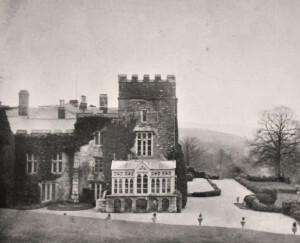 During the World War II, Flete House was requisitioned as a maternity hospital for Plymouth following the bombing of Freedom Fields hospital. About nine thousand babies were born at Flete, and each mother was visited personally by Lord Mildmay who was still living there, and given a signed photograph of Flete as a memento. After the war ended, Flete continued to fill the role of Plymouth’s maternity hospital until 1956, when repair works to Freedom Fields were complete. I was a flete baby . I wasn’t born until October 1957! I was born there on 7th September 1946 . Paul Edginton. I was a Flete baby, I was the first baby born on Christmas Day in 1948. Because I was the first baby born that Christmas my mother was presented with a pram set from India. I was a Fleet Baby. Born on the 9th October 1957. My mother was at Fleet waiting for labour to stop. My father caught a bus from Plymouth. My father walked my mother to the pub in Ermington, where she had a pot of cockles. Her labour started that night, she thought it was because of the cockles, I was her first baby. She told me she had to climbed the Great staircase while in labour to go to the delivery room I believe. I always wanted to go and have a look, but it is now private apartments. This was in 1948. What a great story Diane! Flete does occasionally have Open days. We will put the dates of next year’s as soon as we have them. I don’t remember the first days there (Dec 1946)! However, having moved away from the area back in 1965 to establish a career in the airline world, I returned for a quick look last year. What an impressive place in lovely surroundings. Now that the House is aimed at the older generation (like myself) the wonderful irony presents itself that, having been born there, one could also end one’s days there! My mother gave birth to my brother in 1956, a Flete baby. She was from Kingsbridge also – maiden name Jerwood, married Swainston. I was a Flete baby, born 6th June 1952, my dad who was a chef (cook) in the Royal Navy at Admiralty House Devonport. My dad use to cycle in every day to see us, would love to be able to go and have look around, I know that it is private residence now. My dad was born at Flete in 1948. My nan remembers the room having had the portraits and paintings removed ,you could see clearly where they had been on the wall. My husband, Bob was a Flete Baby. 12/10/55. He said loads of his classmates at primary school in Salcombe were born there too. I was not a Flete baby but our family was from Ermington and my Aunt worked at Flete when it was a maternity unit. Full circle as my sister worked there in the dining room when the house became retirement appartments. I was probably one of the last Flete babies born, Christmas Eve 1957 my father cycled through the snow from Plymouth to visit us. I was also given an angel which had a dress made of cream crepe paper and tinsel as a halo this was attached to my cot Christmas morning. My Dad was a Flete baby, born on 9th June 1942. Sadly he died in 2007. I was born at Flete in 1951. Because of the crenellations on the building I believed as a child that I was born in a castle which made me a princess. My mother was overdue and bored with her stay at Flete so decided to walk in to Modbury, but her labour started in a gateway just past the Flete entrance. Nearly 60 years later I was driving to visit Mum in her care home. My phone rang as I was passing Flete, I pulled into the gateway to answer it and received the news that my mother had just died calmly and peacefully at the age of 92. It was the perfect place to hear the news, closing the circle beautifully. I was a Flete baby, born in December 1955. My father fell asleep after work on the bus travelling to visit me and woke up in Modbury. He stood in the centre of the road and flagged down a bus going towards Plymouth, that didn’t normally stop in Modbury, and the driver reluctantly let him get out at Flete. I’ve always missed the open days – just read about them after the event – so would be interested to attend any future days that are planned. I was born at Flete after my poor mother was in and out many times (I was always a bit slow!). It was quite difficult for the fathers getting there and back, but I’ve always been rather proud of a more stately birth place! My husband was born at Flete in 1953 whilst his father was still serving in the Navy. My Mother in law tells me how she used to walk into Modbury to get the labour going ! Lol. Just after he was born a visit from Lady ? Mildmay proved memorable for my Mother in law as her new precious son peed all over her!!! . Hope you get many more stories . I’ m sure there must be many !! I was born there in May 1952. My dad used to ride his bicycle from Brixton every day for two weeks to see my mum!! Whenever she talked of her labour, she said that she remembered pacing up and down the corridor on her own, with only dim green lighting for company!!!! I was a fleet baby too and that was in November 1957 so it was still a maternity hospital after ’56. My olde brother Chris was born there in July 1956, I wasn’t actually born there but I was taken out there the morning after I was born (2 weeks early due to Mum having toxaemia ). Apparently my Dad was fuming that they had moved us so early on that very cold November morning. I was actually born in Alexandra Nursing Home. I am a Flete baby, born 1st January 1957. My mum, Joan Hamlin, nee, Balmain previously worked at Flete, occasionally helping to deliver babies. I currently live 3 miles up the road & every day draw back my curtains to see Flete House. I was born 14 February 1951 ,I hadn’t returned until last year ,I was let in to ground floor and was struck by the grandeur,I even thought about looking at apartments there. I was a Flete baby! I was born in January 1958. My dad walked to see my mum and me in the snow. I was a Fleet Baby and still have the photo of Fleet signed by Lord Mildmay. I was born on May 21st 1942. My Dad was an engineer I H M Dockyard Devonport. According to my Mum my Dad used to cycle out from Plymouth every night to see us both. I was a Flete baby. Born November 1950. Thick snow when I was born. Would love to have a look around Flete House (Castle). My Auntie and Uncle were Flete babies just as the second world war started. I was a Flete baby born the 17th February 1942, I was disappointed to have missed the reunion that was held some years ago. the photograph given to my mother has been lost. I would be grateful to hear if there are any photographs that can be purchased. I do have some newspaper cutttings and the report on the reunion of the babies born there. My uncle was born here and my nan was very young. Are there any birth records still available April 1944. I was born at Flete on 15th January 1951, and always proudly put Modbury as my place of birth. I now live in Somerset but like to visit from time to time, especially the Exeter Arms, of course. I was a Flete baby in 1953. My mother had been living in the north east of England when she discovered that she was pregnant. Her boyfriend disappeared and, full of shame, she left to join her sister in Plymstock without telling her mother or other family that she was going to have a baby. Three months after I was born I was adopted by a family in Tavistock. I got in touch with my birth family around 2008, my mother had passed away earlier as had the sister that she joined when she knew that I was on the way. I was something of a surprise to my remaining aunt’s and uncles. The strangest coincidence is that I discovered this reference to Flete babies when researching a propertypical that I’m considering buying in the area.I now live in the south east of England . Hello. How did you find your family? I am desperately looking for my aunt born in October 1949. She was given up for adoption as well. I have only recently discovered that I too, am a Flete baby! My dearly departed Mum had always told me I was born in Bideford. I left the U.K. To become an Australian citizen in 1972. I was born at Flete Maternity Home, Holbeton, R.D. And had always thought that the RD was Holbeton Road! I was born at FLeet HOuse on 11Jan 1942. My father was stationed in Plymouth. My mother’s family lived in Durham. My aunt travelled from Durham to help us back my mother was quite ill at the time. I was told that the train was stopped as there was a bombing raid and passengers had to take shelter under a bridge. I was baptised at Saint Michaels church in Plymouth and one of my god parents was a Mrs Hookway whom I never met. I would really like to hear about any reunion. My Father Michael Roach was a Flete baby and was born in August 1946 sadly his Mother disappeared soon after she had the last name Eccles if anyone remembers anything my dad would love to find out what happened. I’m searching but hard to find anything except marriage and birth certificate. 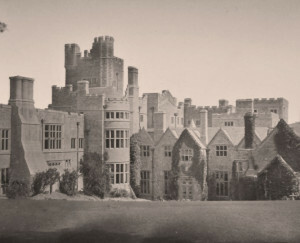 I was born at Flete Manor House on Friday, March 13, 1942. I don’t remember anything about that day or the nearby years. I read that the mothers received a signed photograph of the manor so I asked my mother today if she had it. She doesn’t remember ever getting one. Perhaps someone would photograph theirs and post it on this webpage to help others who have lost their copy. It would also be useful to see a list in chronological order of the names and birthdays of everyone born there, or (being selfish) the first one thousand names. I now live in Ottawa, Canada but am visiting my mother living with my sister in Plymouth in 2017. Our parents lived through very frightening times especially being so physically close to those who might have invaded without warning at any time. We ought to regularly give God thanks for the courage of our parents as well as all those who served in the armed services. May He continue to protect the survivors and ease those who are suffering. I’m a Fleet Baby born bsnk holifay Monday 1st August 1955. My mother was in 3 weeks confinement there and is still alive, she can retail lovely stories of the grounds. I was a Flete Baby, born October, 1950. My Grandfather, served in the Royal Navy, in WW1 and WW2. I was also a Flete baby, born Feb. 3, 1949. Our family left England and wound up in western Canada. As a child I was quite excited to be told I was born in “a castle”. I still have a tiny newspaper cutting from the time Flete House was threatened with demolition which thankfully didn’t happen.. I was born here 26 November 1949. My parents lived in Plymouth both navel people. Dad latterly in merchant navy. Dad’s family Elliotts lived in Plymouth and mostly lived in Devenport/Seaton areas. We as a family moved to Manchester in 1953. Hello. Is your Mum still alive or did she teel anything about her time at Flete? My aunt was born in October 1949 at Flete house. She was given up for adoption. I would like to know anything about the time at Flete. I was born in July 1950 at Flete House. My mother told me on countless occasions that I was actually born in Lord Mildmay’s bedroom which had then been turned into a small ward. I am not so sure now as Lord Mildmay was still in residence at the time!! My mother never mentioned ever meeting Lord Mildmay nor receiving a signed photograph of Flete. I understand that there is an open day in July and will attend once I establish the date! I am hoping to at least visit Lord Mildmay’s bedroom and am interested to know if there is a register of all the births at Flete for the babes to view. Its amazing to hear from so many Flete babies; such a range of stories, all with very different endings. I was born at Flete in 1947. My mother said that the windows were always open & all the women were scared of bats flying around! When we were children, every time we travelled from Plymouth to Bigbury, as we crossed the hump back bridge, we were all reminded of that story & how my father would ride his bike from the Dockyard, to visit. I was born in flete house 9th of September 1944. I Was born at flet e house 9th September 1944. I was born in Forte House 9th. September 1944. I was born in Forte House 9th September 1944. My mother-in-law who has passed on now who’s favorite tv show was To The Manor born with Penelope Keith and Peter Bowels, with speech and mannerisms she kept saying she saw me as the Peter Bowels character, this is before i found out i was a Flete baby. I was born at Flete on the 25th December 1951, mum always said I was the best Xmas present she ever had. Flete holds a garden opening once a year with house tours. Once we have the dates for next year we will put them up on our diary of events page http://www.flete.co.uk/diary-of-events/. Keep your eyes peeled! I was a fleet baby ,born 6 Sept,1946. Visited in 2011 now it’s apartments,but still a wonderful settings. Just come across this web site and have found a lot of the comments are very interesting. I came across it whilst searching Yealmpton. I always remember when I was young my mother talking about Lord Mildmay’s Estate and that I was born there. Sounded Posh when we were kids. Date of birth 2nd May 1953. So yes I am a flete baby. Dad served in the Royal Navy at the time. I am trying to find out weather my father was a flete baby, he was born April 1953, Is there any records of babies delivered at flete house? thankyou. I’m afraid that there aren’t any records at the house. The best starting point for information would be the Plymouth and West Devon archives: https://plymhearts.org/archives/. Good luck! I was born in January 1951. Mother was a WREN and father was serving in American Navy and at sea when I was born. I was a Fleet baby and was born 1st October 1957. I was birn there in 1947 and my brother 1944, when I was born my dad was working as a driver for Western National, there were several other drivers with their wives in Flete at the same time, you can imagine they were all trying to be the driver on that route. Our mum said my brother was born in the tower,. We both went to the reunion that the one show did. I was a Flete baby born 25th December 1951.would love to visit one day, silly thing is I live in Plymouth. Lorraine Ann Jones Born Flete 3 March 1956. My mother’s name was Jean Olive Jones (9/9/36-4/7/12). Mum told me that the mums waiting to deliver were expected to help wirh chores and be helpful to the mums who had already delivered. I was 3 days old before my father managed to get over from Plymouth to see me. My mother had to make her own way home. She said it was snowing as she stood outside Flete with me in her arms and her suitcase beside her waiting for the country bus to Plymouth.when i was little my father would say i was a princess because i had been born in a castle. This may account for my airs & graces! I’m trying to locate Michael John HOOPER ( subsequently adopted) who was born at Flete House on 9th February 1948. Is there anybody who could help[ ??? Did you get any responce and know how to find? I am trying to find my aunt born 7 October 1949 at Flete. Thank you for your message. There are no records held at Flete any more. The best place to start is the Plymouth and West Devon archives: https://plymhearts.org/archives/. I haven’t heard of another open day planned yet but once I do we will post on this website. I was born at Flete 12th February 1948. Mum worked for the paper mill at Ivy bridge & Dad was in the army (6th Airborne). We were living at farmer Mole’s at Ermington where we had been evacuated to after a bomb had landed in the family home at St Judes. I live nearby at Elburton now. My name is Karen and I was born at Flete House on 11th October 1956. My mother has been recalling her time there and as I am now a widow, I have been considering downsizing and moving back to my roots (I live in Wimborne, Dorset). Yes, I’m another Flete baby, born to my Austrian mother on 17th March 1948. My father met my mother when he was in the British forces stationed in Leoben, Austria and married in Graz, Austria. He then brought his new wife home to Plymouth, shortly after she became pregnant and I was born at Flete. I have been to the gardens on an open day, but would dearly like to look around the house, but sadly I gather this is not now possible, I live in hope !!!!!! What a wonderful 70th birthday present it would be if I could visit the house in March 2018. I am a Flete baby. Born on the 11th November 1956. Hoping there are archived records of my birth! I was born at Flete house on 9th September 1955, our family were from Kingsbridge. My parents were Jack and Angiolina Weeks. I was a fleet baby born on the 6th Sept 1946. My parents, my mother was from Stonehouse, my father from Calstock. I was born at Flete in March 1949. My mother spoke of its isolation, how very quiet it was and how lonely she felt. She was terrified by the bats. I feel privileged to be part of a smallish company who can claim to be a Flete baby. A Flete baby, I was born on January 22nd 1948. My Scottish mother met my Cornish father whilst they were both in the forces. They lived in Plymouth when they first got married. When I was 9 months old we went back to Scotland on holiday – and never left. Funnily enough, a number of years ago I opened The Sunday papers to find an article on Flete. The date of the article was January 22nd. Quite the irony. I have just got my Birth Cert and see that I was a Flete baby address Flete Maternity Home Holberton Rd. D.O.B. 19th March 1947. I was born 12th may 1944,ive always wanted to go back to see it again. I was born at Flete in 1943. This is the first photograph I have seen – what a beautiful house! Bill Loveys. I was a fleet baby born 17th April 1948. My parents still with us ( may 2018) celebrated their 70th wedding anniversary last year. My brother and I are Flete babies, me (Andrew Stapleton) born 21st July 1955 and my brother(Barry Stapleton) born 16th April 1954. We lived in Holbeton and often return to our spiritual home. I was in the area on 3rd June 2018 and took the opportunity to drive up to the house and grab a photo as a momento. I was born on the 22 September 1943 at Flete House. My Father was in the Royal Navy based at Devonport. My parents lived at Crownhill until the end of the War. I would love to have the opportunity to return to Flete. If any reunion or open days planned is there anyway I could be added to a list. My mum was the last baby to be born at Flete and she still has the engraved tankard they gave her for being so. I’ll show her this as my mum and gran might have an interesting contribution maybe even photos. Will there be an open day when they could visit please? I was born at flete house april 1948 and would like to go back and see the place I was born a castle in the southhams area modbury. they say its very nice and a pleasant area.